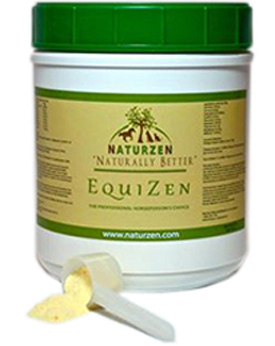 EquiZen – Palatable daily supplement that is water soluble, encourages a healthy appetite due to natural appealing flavouring. Developed by world renowned doctors in health, this product creates a natural healthy balance by normalizing and optimizing the function of the tissues in the horse allowing them to thrive at their intended level of function. The patented formula comprised of the primary ingredients Carnitine, Taurine and Coenzyme Q10 are balanced in specific ratios that are found to improve cellular function and energy metabolism through the mitochondria. Research trials have shown reversal of pathology of tissues using this supplement. Healing of damaged tissues and organ systems can be optimized allowing your horse to recover and repair injuries occurring through regular competition. In human athletes, athletic performance was improved in a timed running event during trials. Laboratory studies in hamsters and people demonstrated significant improvements in treadmill performance after 14 days of supplementation. This product is safe for young to retired horses and is a great way to supplement your equines daily diet. I Have seen drastic changes in my horses attitude and muscle mass. Their appetite picked right up and general looks improved! I highly recommend the product to help improve the performance and have had nothing but good luck since we added the "Crush" to our daily routine. © 2014 naturzen.com. All rights reserved.